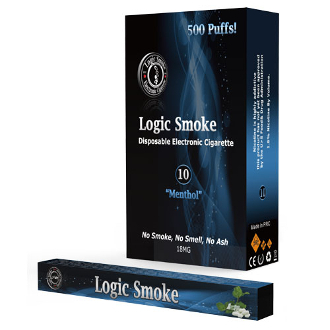 Our Menthol Flavor Disposable Electronic Cigarette from Logic Smoke is a classic menthol flavor with a kick. It’s frosty, minty flavor will freshen your vape and leave you feeling exhilarated. This is the perfect flavor for anyone looking for a cool menthol experience, whether you are in search of a menthol cigarette replacement or simply enjoy Menthol flavors. Soft tip disposable electronic cigarette This top of the line disposable electronic cigarette from Logic Smoke has the newest technology. Made up of a cartomizer filled with the best e-liquid and a lithium ion battery; this comes completely charged and ready to go. There is no maintenance involved at all with this disposable e-cigarette. Just open, remove the sticker from the vent hole and start puffing. Its soft tip gives added feelings of smoking a regular cigarette and it is light weight and comfortable to hold and use.